"Iceberg" redirects here. For other uses, see Iceberg (disambiguation). Capturing certain mice under certain conditions in the Iceberg will move the Hunter to the Slushy Shoreline. The Iceberg is a location in the Rodentia region requiring a minimum rank of Lord or Lady and the Icebreaker License to enter. Mice in this location may steal points, gold, or multiple pieces of cheese if not captured. Hunters with 25,000,000 points can obtain the Icebreaker License from the Harbour Cartographer or S.S. Huntington III Cartographer for 145,000 gold. All mice found in the Iceberg are part of the Icewing's Invasion group and are weak only to Hydro weapons. Traveling from this location does not reset the Hunter's progress. The hunter is automatically transported to the Slushy Shoreline after successfully fighting through the iceberg, or when reaching 250 hunts while in the Hidden Depths or The Deep Lair. Hunters must navigate each zone and then defeat a General to gain access to the following zone. Capturing mice in these zones will move the Hunter through the Iceberg. Failing to capture mice in these zones will sometimes cause Hunters to lose progress. Each zone has a set length and when Hunters complete their move through a zone they will encounter one of four Generals which must be captured before the Hunter can move into the following zone. Hunters will enter Icewing's Lair after successfully navigating all 1,800 feet of the Iceberg and capturing a final Iceberg General. The first time Hunters enter Icewing's Lair, Icewing will not be present and Hunters will need to capture the Frostwing Commander. On all subsequent runs, whether Icewing is present depends on how many hunts Hunters needed to reach Icewing's Lair. The Iceberg has smashed the first of the bonus chests! Two more still remain, so keep hunting! The Iceberg has smashed the second of the bonus chests! There is still one more chest to claim! The Iceberg has smashed the last of the bonus chests, and Icewing has moved on to supervise another Iceberg invasion. She has left her second-in-command in charge, who must still be defeated to destroy the Iceberg and protect the good people of Gnawnia. With most of the fighting mice leaving the Iceberg, the Living Salt mouse can finally roam free, making progress significantly easier. To access the Hidden Depths Hunters must capture Icewing in fewer than 250 hunts and with the Deep Freeze Base armed. It will take a minimum of ten hunts to travel through the 200 feet of the Hidden Depths and reach the Deep Lair, so Hunters must have at least eleven hunts (10 for Hidden Depths, 1 for The Deep Lair) remaining after defeating Icewing and entering the Hidden Depths if they wish to reach The Deep Lair and capture the Deep Mouse. With the Iceberg crumbling all around you, you figure you have but one more turn left. It's time to put everything you have into this one final hunt! It's too dangerous to hunt here any longer! With seconds to spare, you jump in your life raft and paddle furiously away, swearing to return next time and conquer! The Iceberg is crumbling! You have only until Hunt #250 to defeat the Deep Mouse! Hunter's must travel through the 200 feet of the Hidden Depths and enter The Deep Lair before reaching 250 hunts. The Deep Mouse is a guaranteed catch on hunt 250 unless Hunters fail to attract the mouse, it is therefore recommended that Hunters arm SUPER|brie+ if they have not captured the Deep Mouse by hunt 249. Capturing the Deep Mouse will move the Hunter to the Slushy Shoreline. With the Deep Mouse in your trap, the Iceberg finally begins to crack apart around you. With seconds to spare, you jump in your life raft and paddle furiously away, laughing about your incredible victory! The image in the HUD shows the Hunter's progress into the Iceberg. The number of hunts taken. Status of the Hunter's Ice Drill, number of Drill Charges used, and number of Drill Charges in inventory. Want to descend through the Iceberg faster? Buy the Ice Drill Mk. 1 from the General Store and carve your way to victory! Use Drill Charges to drill 20 feet down. You can use it [X] times during this Iceberg invasion. Your ice drill has overheated! You have used it to the maximum [X] times during this Iceberg invasion. There are a number of items that can help the Hunter better navigate the Iceberg. There are four weapons that have special effects in the Iceberg location. These weapons must be created in a specific order. This weapon provides an additional 1,750 Power and 3 Luck in the Slushy Shoreline and Iceberg. Smashing the Steam Laser Mk. I with the Hunter's Hammer produces Steam Laser Mk. I Parts, which are required for crafting the Steam Laser Mk. II. The Steam Laser Mk. I can be reassembled from Steam Laser Mk. I Parts. The Steam Laser Mk. II can only be crafted given the proper ingredients. It requires Steam Laser Mk. I Parts obtained by smashing the Steam Laser Mk. I with the Hunter's Hammer. This weapon provides an additional 1,250 Power and 2 Luck in the Slushy Shoreline and Iceberg. Capturing Icewing with this weapon converts it to the Steam Laser Mk. II (Broken! ), which is required for obtaining trap parts necessary for crafting the Steam Laser Mk. III. The Steam Laser Mk. II (Broken!) can only be obtained by catching Icewing with Steam Laser Mk. II. This trap has zero power and will not capture mice. Smashing this weapon with the Hunter's Hammer results in Steam Laser Mk. II Parts, which are used in crafting the Steam Laser Mk. III. This weapon provides an additional 1,500 Power and 2 Luck in the Slushy Shoreline and Iceberg. There are five bases that have special effects in the Iceberg. The Magnet Base can only be crafted given the proper ingredients. This base increases the attraction rate of the Chipper and Icebreaker mice in the Treacherous Tunnels and the Bombing Run and the Chipper Mouse in the Mad Depths. The Spiked Base can only be crafted given the proper ingredients. This base prevents the loss of depth when encountering Mammoth and Yeti mice in the Brutal Bulwark and the Snow Bowler Mouse in the Brutal Bulwark, Bombing Run, and Mad Depths. The Remote Detonator Base can only be crafted given the proper ingredients. Using this base to capture the Heavy Blaster, Saboteur, and Stickybomber mice in the Bombing Run advances Hunters 20 feet. The Hearthstone Base can only be crafted given the proper ingredients. This base repels Iceblade and Water Wielder mice in The Mad Depths. The Deep Freeze Base can only be crafted given the proper ingredients. The Deep Freeze Base receives a bonus 665 power and 9 luck before hunt 250 in Icewing's Lair, the Hidden Depths and The Deep Lair. Hunters wishing to enter the Hidden Depths in order to access The Deep Lair must use the Deep Freeze Base to capture Icewing before hunt 250. If Hunters prefer the strength or luck provided by another base, the Deep Freeze Base can be disarmed after capturing Icewing. Its use is not required in the Hidden Depths or The Deep Lair. This Limited Edition base combines the effects of all five bases listed above. It was only available for purchase from Ronza's Traveling Shoppe 2017. These charms can be used in the Treacherous Tunnels, Brutal Bulwark, Bombing Run, and The Mad Depths. They provide no effect in Icewing's Lair, the Hidden Depths, or The Deep Lair. A Sticky Charm 5-Pack can be bought at the Slushy Shoreline Charm Shoppe or Iceberg Charm Shoppe for 1 War Scrap. The Wax Charm provides a progress bonus of 1 foot when catching a Bergling mouse. A Wax Charm 5-Pack can be bought at the Slushy Shoreline Charm Shoppe or Iceberg Charm Shoppe for 1 War Scrap. Wax Charms are dropped as loot by mice in the Iceberg. Ice Drills are a specialized drill used to quickly bore through ice, assisting Hunters in reaching greater depths in the Iceberg. There are four types of Ice Drills. Ice Drills and the Drill Charges used to power them can be purchased in the Slushy Shoreline General Store or Iceberg General Store. The more advanced the Ice Drill, the more Drill Charges it can use before it overheats. Once an Ice Drill overheats hunters will not be able to use it again until they start a new run in the Iceberg. Each Ice Drill can skip 20 feet of the Iceberg per Drill Charge used. Drilling past Iceberg Generals will skip them and their loot. Drill Charges cannot be used to skip past Icewing's Lair, but can be used in the Hidden Depths to reach The Deep Lair. Upgrading an Ice Drill during an Iceberg invasion will not cool it down. Example: Using 7 Drill Charges with the Ice Drill Mk. III and then upgrading to the Diamond Ice Drill in the same run will allow you to use 1 extra Drill Charge on that invasion, not an additional 8. Drills can be repurchased after an upgrade if hunters wish to have a complete set, though a complete set confers no bonuses. Your Ice Drill has overheated! You have used it the maximum [X] times during this Iceberg invasion. The Cold Fusion Bomb can be purchased in the Iceberg General Store or Slushy Shoreline General Store in exchange for 25,000 gold and 1 Bottled Cold Fusion. When activated on the Iceberg, the Cold Fusion Bomb ends the Hunter's current invasion and moves them to the Slushy Shoreline. All Iceberg progress is lost. The Cold Fusion Bomb may be used at any time, but scatters the bonus chests, rendering them uncollectible. Because the mice on the Iceberg were not defeated, this does not count as an Iceberg completion so far as the King's record keepers are concerned. The Cold Fusion Bomb shudders, shakes, and coughs. The lights go dim. For a good while, nothing happens. Then, suddenly, the entire Iceberg around you instantly turns to water. You are swamped, and barely able to keep your head above water. When you finally manage to find solid ground beneath your feet, you find yourself on the Slushy Shoreline. The mice found in Icewing's Lair are all part of the Icewing's Invasion group and are weak only to Hydro weapons. Standard Cheese and SUPER|brie+ will attract all mice found in the Iceberg. M400 – This mouse will sometimes be available at the Iceberg when Hunters are actively working an M400 Hunting Research Assignment. It is attracted only to Fusion Fondue which will not attract any other mice. It drops a wide variety of loot. WARNING: Hunts used to capture this mouse will count against the hunts needed for reaching specific areas of the Iceberg. Capturing the M400 provides no movement through the Iceberg. The Treacherous Tunnels have a depth of 300 feet. The Treacherous Tunnels are the first section of the Iceberg that Hunters will encounter. I entered the Iceberg. Busily burrowing Tunnel Rats roam the corridors, carving new pathways in the fragile ice! The mice found in Treacherous Tunnels are all part of the Icewing's Invasion group and are weak only to Hydro weapons. Standard Cheese and SUPER|brie+ will attract all mice found in this zone. Wax Charms will provide a 1 foot bonus when capturing Bergling mice. Sticky Charms will prevent losing progress when failing to catch the Bergling mice. The Magnet Base will improve the attraction rate of the Tunnel Rat mice. The Brutal Bulwark has a depth of 300 feet. 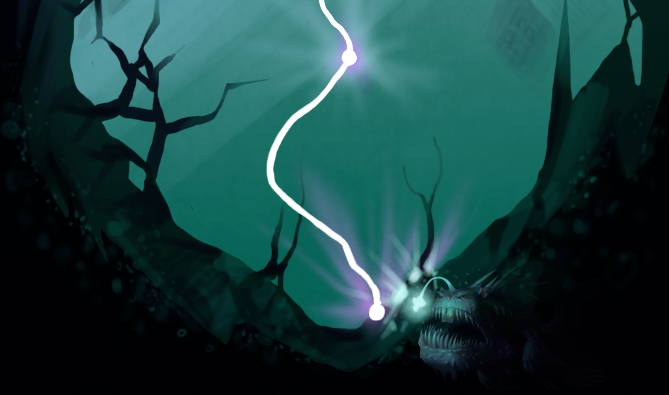 To enter the Brutal Bulwark, Hunters must complete the Treacherous Tunnels and either defeat an Iceberg General or use a Drill Charge to skip over the General encounter. I entered Brutal Bulwark. Massively strong Brute mice knock back all who approach! The mice found in Brutal Bulwark are all part of the Icewing's Invasion group and are weak only to Hydro weapons. The Spiked Base will prevent losing progress when encountering Brute mice. The Bombing Run has a depth of 1,000 feet. To enter the Bombing Run, Hunters must complete the Brutal Bulwark and either defeat an Iceberg General or use a Drill Charge to skip over the General encounter. I entered Bombing Run. Explosions echo off the walls - surely the work of the Bomb Squad! The mice found in the Bombing Run are all part of the Icewing's Invasion group and are weak only to Hydro weapons. The Remote Detonator Base will cause Bomb Squad mice to provide 20 feet of movement when captured. The Mad Depths have a depth of 200 feet. To enter The Mad Depths, Hunters must complete the Bombing Run and either defeat an Iceberg General or use a Drill Charge to skip over the General encounter. I entered The Mad Depths. The mad cackles of the Zealot Mice cause goose pimples to form! The mice found in The Mad Depths are all part of the Icewing's Invasion group and are weak only to Hydro weapons. The Hearthstone Base will repel Zealot mice. Generals appear as an encounter between the Treacherous Tunnels and the Brutal Bulwark, between the Brutal Bulwark and the Bombing Run, between the Bombing Run and The Mad Depths, and between The Mad Depths and Icewing's Lair. Generals are not encountered beyond Icewing's Lair. Hunters must defeat a General in order to move into the next zone. Using a Drill Charge will skip the General encounter and mover the Hunter into the next zone. I caught an X Mouse and advanced through the Iceberg, but was stopped by a General! A challenge awaits! If a mouse is caught near the end of a zone that advances a hunter perfectly to the end of their current zone, the above message is not displayed. Hunters will encounter a randomly chosen General between zones and will have 3 encounters in which to capture it. If the Hunter fails to capture that General after three encounters, another General is randomly selected from the four and the Hunter will have another three encounters to capture the new General. Hunters can encounter the same General as in the previous set of encounters. Successfully capturing a General will move the Hunter into the next zone. Failing to capture General Drheller will send the Hunter back 6 feet into the previous zone. Hunters will then need to capture mice to move them forward 6+ feet to the General encounter, where they will encounter General Drheller a second time. Failing to capture General Drheller for a second time will again send the Hunter 6 feet back into the previous zone. Hunters will then need to capture mice to move them forward 6+ feet to the General encounter, where they will encounter General Drheller a third time. Failing to capture General Drheller for a third time will again send the Hunter 6 feet back into the previous zone. Hunters will then need to capture mice to move them forward 6+ feet to the General encounter, where they will encounter a randomly selected General. By purposefully failing to capture a General, Hunters can stay in the General encounter and cycle through Generals until the mouse they wish to encounter is selected. The Iceberg General mice are all part of the Icewing's Invasion group and are weak only to Hydro weapons. Standard Cheese and SUPER|brie+ will attract all four Generals, but SUPER|brie+ will increase the attraction rate of General Drheller. 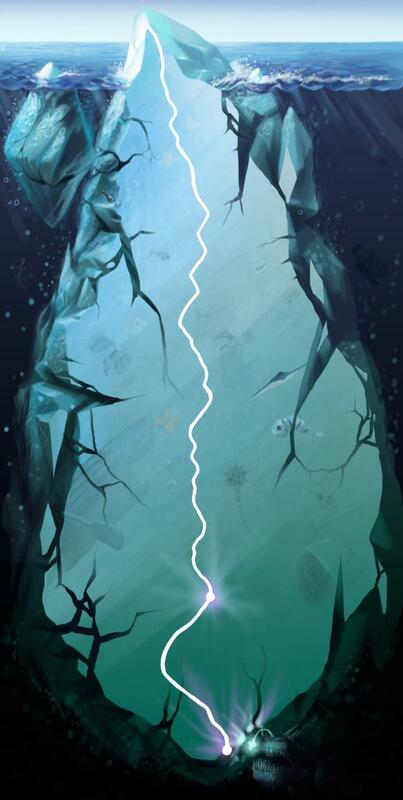 To enter Icewing's Lair, Hunters must complete The Mad Depths and either defeat an Iceberg General or use a Drill Charge to skip over the General encounter. Successfully capturing the Frostwing Commander will end the Hunter's Iceberg run and move them to the Slushy Shoreline. Successfully capturing Icewing without the Deep Freeze Base armed will end the Hunter's Iceberg run and move them to the Slushy Shoreline. Successfully capturing Icewing with the Deep Freeze Base armed, and in fewer than 250 hunts, will allow the Hunter to access the Hidden Depths. Hunters entering Icewing's Lair for the first time will not be able to encounter Icewing. The Frostwing Commander will be present, along with Frostlance Guard mice. I entered Icewing's Lair. Icewing herself has since moved on, but she's left behind her second-in-command, the Frostwing Commander, who must be defeated to save the good people of Gnawnia from this icy invasion! I successfully fought through the Iceberg in X hunts, saving the good people of Gnawnia from the wrath of Icewing's invasion! In amongst the Iceberg's wreckage is X bonus chests! I successfully fought through the Iceberg in X hunts, saving the good people of Gnawnia from the wrath of Icewing's invasion! Hunters reaching Icewing's Lair in 425 or fewer hunts will be able to encounter Icewing. Icewing will retreat when Hunters exceed 425 hunts while in Icewing's Lair. Hunters will not be able to encounter Icewing if they enter Icewing's Lair with more than 425 hunts. After 425 hunts, Icewing is replaced by the Frostwing Commander. I entered Icewing's Lair. This is it – the big showdown! Fueled by her terrible defeat at your hands, Icewing has destroyed and defaced your trap in a fit of icy rage! But in her haste, she seems to have dropped something – perhaps combining it with the destroyed trap parts will create a trap she truly fears! The Iceberg begins to shudder and shake, no longer held together by Icewing's terrible magic. Her capture sets off explosions that rip through walls, collapsing entire sections at once.Leaping from the crumbling wreckage, you notice a tunnel collapsing in the distance. If only you had more time and a safe method to preserve the Iceberg's structure, perhaps you could have explored it! Whether the hunter remains in the Iceberg or is returned to Slushy Shoreline after catching Icewing depends only on how many hunts have elapsed and what base was armed, and not what trap was in use. To access the Hidden Depths, Hunters must defeat Icewing with the Deep Freeze (or Ultimate Iceberg) base armed and in fewer than 250 hunts. I entered Icewing's Lair and my Deep Freeze Base began glowing! Something's happening! The message is similar if Ultimate Iceberg Base is armed. The Iceberg begins to shudder and shake, no longer held together by Icewing's terrible magic. Her capture sets off explosions that rip through walls, collapsing entire sections at once. In response, your Deep Freeze Base emits an icy chill, and the explosions slow and then cease. The Iceberg continues to shudder distressingly, but you judge you have [X] hunts remaining to explore. Capturing Icewing with the Deep Freeze Base armed, and in fewer than 250 hunts, will allow Hunters to access the Hidden Depths. The Hidden Depths have a depth of 200 feet. To access the Hidden Depths, Hunters must defeat Icewing with the Deep Freeze Base armed and in fewer than 250 hunts. To access The Deep Lair, Hunters must complete the Hidden Depths before reaching 250 hunts. The mice found in the Hidden Depths are all part of the Icewing's Invasion group and are weak only to Hydro weapons. The Deep mouse is the only mouse found in The Deep Lair and is part of the Icewing's Invasion group and is weak only to Hydro weapons. Standard Cheese and SUPER|brie+ will attract the Deep mouse. All mice found in the Iceberg are part of the Icewing's Invasion group and are weak only to Hydro weapons. Standard Cheese and SUPER|brie+ will attract all mice found in the Iceberg. Hunter's are automatically transported to the Slushy Shoreline after successfully fighting through the iceberg, or when reaching 250 hunts while in the Hidden Depths or The Deep Lair. Hunters must navigate each zone of the Iceberg and then defeat a General to gain access to the following zone. Capturing mice in these zones will move the Hunter through the Iceberg. Failing to capture mice in these zones will sometimes cause Hunters to lose progress. After 425 hunts no chests are awarded. To access the Hidden Depths Hunters must capture Icewing in fewer than 250 hunts and with the Deep Freeze Base armed. 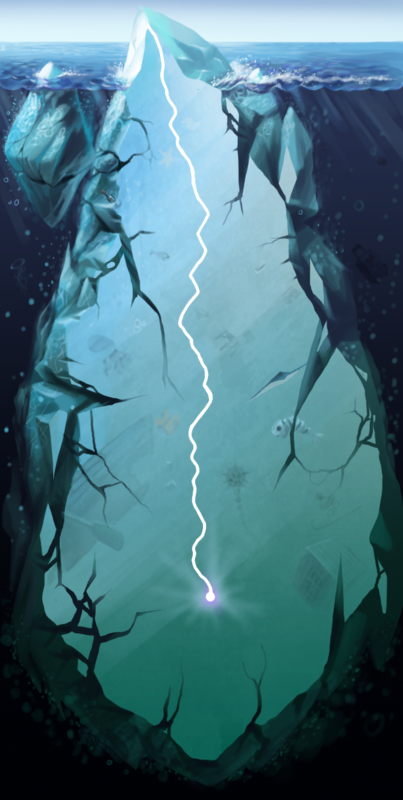 It will take a minimum of ten hunts (without using Drill Charges) to travel through the 200 feet of the Hidden Depths and reach the Deep Lair, so Hunters must have at least eleven hunts (10 for Hidden Depths, 1 for The Deep Lair) remaining after defeating Icewing and entering the Hidden Depths if they wish to reach The Deep Lair and capture the Deep Mouse. The Deep Mouse is a guaranteed catch on hunt 250 unless Hunters fail to attract the mouse, it is therefore recommended that Hunters arm SUPER|brie+ if they have not captured the Deep Mouse by hunt 249. Capturing the Deep mouse will move the Hunter to the Slushy Shoreline. Living Salt mice become more numerous once Hunters exceed 425 hunts. Hunters wishing to target the Living Salt Mouse can arm a trap setup that results in more failures to catch which will increase the number of hunts taken without providing positive movement through the Iceberg. Hunters wishing to capture a specific Iceberg General can use General Cycling to encounter the desired mouse. Hunters will need to make several trips through the Iceberg in order to craft all of the Iceberg Bases and all of the Iceberg Weapons. Obtaining the Iceberg Weapons allows Hunters to purchase Ice Drills that use Drill Charges to move the Hunter through the Iceberg. The Wax Charm provides a progress bonus of 1 foot upon catching a Bergling in the Iceberg. The Sticky Charm prevents losing progress when failing to catch a Bergling in the Iceberg. The Steam Laser Mk. I receives a bonus of 1,750 power and 3 luck in the Iceberg. The Steam Laser Mk. II receives a bonus of 1,250 power and 2 luck in the Iceberg. The Steam Laser Mk. II (Broken!) results from catching Icewing with Steam Laser Mk. II. The Steam Laser Mk. III receives a bonus of 1,500 power and 2 luck in the Iceberg. The Limited Edition Ultimate Iceberg Base combines the effects of all five bases listed below. The Magnet Base attracts Tunnel Rat mice when equipped in the Treacherous Tunnels zone of the Iceberg. The Spiked Base prevents losing progress when encountering Brute mice in the Brutal Bulwark zone of the Iceberg. The Remote Detonator Base provides a progress bonus upon catching Bomb Squad mice in the Bombing Run zone of the Iceberg. The Hearthstone Base repels Zealot mice when equipped in The Mad Depths zone of the Iceberg. The Deep Freeze Base grants access to Hidden Depths upon catching Icewing and receives a bonus of 665 power and 9 luck before hunt 250 in Icewing's Lair, Hidden Depths and The Deep Lair of the Iceberg. Hunters can complete the Hunt for Icewing by catching Icewing in the Iceberg using the Steam Laser Mk. II to recover Zugzwang's Scarf. M400 Hunting Research Assignment - This assignment may require capturing the M400 in the Iceberg. WARNING: Hunts used to capture the M400 will count against the hunts needed for reaching specific areas of the Iceberg. Capturing the M400 provides no movement through the Iceberg. Iceberg mice are worth points during some Tournaments. Many mice in the Iceberg are often found on Icebreaker Treasure Maps and Relic Hunter Treasure Maps. Our brave and daring scouts have reported that the Iceberg is broken up into five distinct zones with different mice in each. The further down you go, the more dangerous it becomes! Treacherous Tunnels: Tunnel Rats roam these halls, ever-expanding the Iceberg's tunnel network. Their tools can be put to use making your own tunnels, so catch as many of them as you can! Bombing Run: Bomb Squad mice use high explosives to carve huge caverns and trip up intruders. But if you could turn their bombs against them, you could certainly speed up your descent. The Mad Depths: Mad Zealot mice prowl here. They are both hard to catch and powerful – they will knock you back if you don't catch them. Avoiding them would be best. Icewing's Lair: Icewing herself commands the Iceberg's deployment from here, deep in the heart of the Iceberg. Be brave in facing her, hunter, as she will give no quarter! If you check the shops, there's loads of new gear to help you combat these new dangers, including Wax Charms and Sticky Charms, which have specific uses against Bergling mice, whom you'll find in every zone. Floating in the path of the Iceberg are three bonus chests holding supplies for the icy invasion. If you can defeat the Iceberg before it reaches them, their contents will be yours! If the Iceberg crashes into them, their contents will be lost to you as they float ashore to be used by the invaders, so work quickly for the most rewards! This page was last edited on 30 January 2019, at 18:14.